A: No, I have been to China several times as a tourist with my family. A: I really love it! The best part about studying the language in the country where it's spoken is that what you learn in class in the morning can directly be used that evening on the streets. It's also really fun, discovering new people, new places and having completely new experiences. I feel so fortunate to be here. A: I enrolled for the intensive course covering spoken and written Chinese for 2 months. I actually didn't expect to learn so much in such a short period of time. I like the way the lessons are structured and the way my laoshi teaches. After being here for 3 weeks, I feel that I have quite a satisfactory grip on survival Chinese. A: The never ending mass of people streaming up and down Nanjing Lu day and night – where do they all come from?? Also the fact that there is always something new to discover. I wish I had the money to explore and discover everything in Shanghai. Q: Tell us a few of your most memorable experiences in China so far? A: Be as open minded as possible, every moment is a chance to practice and have a great time. A: 24 weeks of Intensive 30 Course. The program fulfilled my expectations. I am really glad about it. Q: What do you find most interesting about Beijing? A: You can do everything here! It never gets boring! You can go sightseeing, go out in the evenings, go shopping, go to the theatre or take a walk in one of Beijing's park meanwhile practice your Chinese. A: I won't forget the Chinese New Year. It was really interesting also the 60 th anniversary. A: If you want to experience a totally new culture, don't miss the opportunity to come to China. Learning Chinese may not be easy, but once you start studying it, you can't stop! A: My course was Intensive 30 for 18weeks. The program supposed my expectation. I believe I learned a lot and still want to learn more and more back next year! A: Beijing is a great city. It's the capital of the most important country in the world, so expect something really big It's huge, modern and powerful and really cold in Beijing! The ancient places are astonishing and hopefully they won't soon be swallowed by the development of this massive city. A: It's a good experience. Chinese is a unique language and the only way to learn it is coming to here and seeing how really it is spoken. The school also offers a lot for the students. There is always something to see, somewhere to go! Hobbies: Read, travel, take pictures, go shopping, play basketball, ride motorcycles. Q: How are you finding your studies in China ? I find them super nice. I like that the apartments are just one block away from the school. I like how there are people from everywhere and I have many new international friends. A: Intensive program for a year. It has been much better than I expected! In the first week, I knew how to introduce my family! A: Its culture and its people. I like the Pudong Skyline at night, its so beautiful! The Fake Market is awesome, I'm definitely going there before I go back to Panama so I can buy nice stuff for my friends and family members! A: I can believe how very cheap everything is here. I went to this restaurant and I had my dinner and when it was time to pay I thought there was a mistake in the bill! The food was delicious and it was so cheap! I go there all the time now haha. A: I would tell them to come so learn this magnificent language that will help them so much in their future. I think it brings many new opportunities. If you want to learn mandarin for your career or just for the sake of it, this is definitely the place to be. A: I only have morning lessons so I have a lot of spare time, which is great! I have time to experience Shanghai in my own way and tempo. The program has been much more than I expected! I have learned so much in a very short time! And the teachers are all very good and the class is only 5-10 people so they are small and personal. A: The people! As I study psychology I like to see different cultures and “learning by trying” is something I really like. And the Shanghaines people I have meet are very helpful and friendly. A: Every day is a new experience! But I think the food is the most memorable! I like to try new things and I like to order the strangest food I can find in the menu every time I'm out eating. It is a fun way to learn the food culture! A: My best advice is to try, try, try. China has a great culture and you learn so much by trying everything you can find. Try to live as close to the culture as possible, talk to people, go where local people go etc, this is a great chance to learn both about a new culture and learn things about yourself! A: I enrolled in Combined 25. It's definitely as good as I expected. In the morning we practiced Pinyin and oral Chinese. All of them are very useful because we use them in our daily life, like in restaurants and supermarkets. A: The most interesting thing is that Beijing is a mixture of the old Chinese culture and the new modern world. You can visit lots of places and feel about Chinese culture. Hutong leaved me deep impression that you rent a bike and get into it where you can see men playing cards and majiang. Beijing is a city that is rapidly changing! A: In general people are very friendly , they want to help you even though they don't speak English. They try to understand what you have said in Chinese and make a short conversation with you. You can grab every chance to speak Chinese . In Beijing , you will feel like being a super star when you appear at some sightseeing places, crowds of people gather around you and take pictures with. What a wonderful feeling it is! A: Try to get a Chinese friend and talk with them to improve your oral Chinese and know more Chinese culture as well. Do not let yourself looks so solemn, try your best to smile and speak Chinese. It is a better way for you to learn Chinese. A: Stand Course 20. It pretty much has been what I expected — a lot of speaking, which was a good thing to practice speaking and listening! A: Beijing is so different from my home and I experienced many new things everyday! This was my first trip to China and I find culture very fascinating. Also, there are so many sights to visit in Beijing. A: Standing on the Great Wall, walking though the Forbidden City, eating Chinese food etc. I have had so many great experiences so far! I also made a lot of new friends from all over the world and could improve my Chinese. A: Preparing for some cultural differences and for a completely different lifestyle. Be open to new experiences and be brave enough to try out some new things. It may take some time to get used to living in China but I think it's worth it! A: I have been in China for professional reasons multiple times. Q: How did you find your studies in China ? A: I am very satisfied. Though I have been here quite a few times I hardly spoke Chinese. After 6 weeks I can already help myself around a little. I know there is still a very long way to go before I can really communicate, debate and exchange ideas in Chinese. A: Intensive Course. I found the books very interesting and easy to learn. The pace might perhaps be a little faster for me, but I guess I can compensate that with learning Hanzi. Overall I am very satisfied about the courses and the good atmosphere at school. A: I like the exotic history of Shanghai and how it left its traces all over the city architecturally and culturally. I keep being amazed about the scale of this city and all the different aspects it shows. A: I guess I'll never forget the first time I came here and I was looking from out the car to the traffic: overloaded trucks, buses, bicycles, tricycles etc, all together in all directions pushing forward. Once I also had dinner in a lake settlement where we bought the fish directly from the fishermen who passed with their boats almost next to our table. Delicious! I will also never forget a ride we once made from Binzhou to Tianjin. The landscape along this coastline is one of the most inhospitable I have ever seen. A: About school: If you don't have much time I think Mandarin House is the best choice. You may think it's expensive but I consider it's worthwhile. About China: Be open-minded, show respect, try everything and enjoy it! A: Standard Course 20. Yes, it fulfilled all my expectations! I wanted to practice my oral Chinese. I am very pleased with the size of the class, everybody gets his/her turn. A: It's very interesting because Beijing is so different and so big! My hometown is so small compared to this city! It is fascinating that old building and traditional culture can exist right next to modern Beijing. A: 1) I could understand a Beijing taxi driver! "Personal Guide", she could give us some information. 3) We went to different restaurants and the food was amazing! 4) Standing on the hill in Jingshan-Park. A: 1) Be aware that life is different here! 2) If you are a vegetarian, you can say: "Wo chi su." 3) Be brave and dare to make new experiences, talk to people! A: This is my fourth time in China. A: When I came to Mandarin House, I had not spoken or heard Chinese for over a year. But I experienced improvement very quickly. I have been really happy about my outcome at Mandarin House. A: I enrolled in Standard Chinese Course 20 for adults. I think that the program has been better than I had expected. I have improved my Chinese more than I thought I would. I really like that the school focus a lot on conversation during class. A: There many things that I really like about Shanghai . The city is so diverse and so alive. You can experience big-city-life with all its hustle and bustle, but then you can walk for 20 min. and you will find neighborhoods where you can see how the locals live. In Shanghai you can always find some one who wants to chit-chat with you and I really like this openness and curiosity towards foreigners. But the most interesting thing about Shanghai is how it changes all the time. A: Over the years I have had many memorable experiences here, so it is hard to choose! I like to travel, so the beautiful mountains of Guilin and the Yellow Mountains in Anhui province really took my breathe away. Really worth a visit! One time I took the train from Hangzhou to Xi'an, a train-ride which should take about 18 hours, but ended up taking almost 26 hours because of heavy rain. I kept thinking "Why did you not take a soft-sleeper or an airplane?" When I finally arrived in Xi'an I was so tired, but I realized that had I not taking this "hard" train-ride, like many Chinese people do, I would not have meet and talked with the nice people I that did. This cultural-exchange is a memorable experience to me. A: It is important to be open-minded when you go to China , take everything, even the things you don't like as an experience. Before you go, read up on Chinese culture, ex. Guanxi and courtesy. When you get to China , talk with the locals, find Chinese friends; watch Chinese TV, because it really helps your listening and pronunciation of words. Languages Spoken: English, German, Rusty Russian, Elementary Mandarin. Hobbies: Music, Sharing new experiences with friends, Walking, Getting to know people in different environments, Learning Chinese! Q: Was this your first time in China ? A: No, I had spent 18 months in Guangzhou, and 6 months in Beijing. A: Very helpful, thank you. A: The city is so large and vibrant that I find I can't really reduce my impressions to one item! However, I found the architecture of new buildings a good talking point, with local people commenting on in various ways. Q: Tell us a few memorable experiences in China ? A: Chatting with taxi drivers, browsing though the large bookshop on Wangfujing, at Xidan and Haidian, walking calligraphers with huge brushes and water in public parks, practicing Chinese language with local people at cafes, enjoying a thunder storm at Tiantan. Q: What advice/tips would you give to others who plan to come and study in China ? speaking opportunities during classroom time. part of a level, if you feel unable to digest new input. be prepared to put in a lot of effort on homework. a positive approach helps you learn more efficiently. A: No, I have been here last year. I was travelling around China. I visited Hangzhou, Suzhou, Guilin, Chongqing and Nanjing. A: It's actually very nice. You learn how to survive in the everyday life. You have to work hard, but the teachers are very helpful in every situation. After the language course I made an internship here in MH. It was very interesting to gain insight the everyday work. My job was to organize the activities for the students. It was very good to have a close contact to students from all over the world. So I acted as a kind of intermediary between the staff, the teachers and the students. My responsibilities were more than I have expected. Q: Has the program been as you expected? A: Feichang hao. I like the familiar situation here in Mandarin House. The teacher, the staff and the cleaning service (Ayi) are very friendly. Living in a single-room shared apartment is the best way to get to know other students. A: Every day you get to know something new. You are walking through the street and suddenly there is a big shopping mall in front of you. You also can try a lot of different food from all of the world. There is nothing that doesn't exist here in Shanghai. And it's very strange how such a huge city with so many people can be organized. A: We went to several markets for shopping. Sometimes you have to bargain a lot. So it's a very good opportunity to improve your Chinese. It's very interesting and funny to talk to chinese people. They are very friendly and try to give you the chance to use your new language. A: Try to immerse yourself into the culture and try a lot of new things. Don't be afraid of the traffic, just go. But the most important thing: be patient. If you want to learn chinese, it's better to learn the characters as well. A: The program of study is very valid and the teachers are always kind and available: I choose for me an intensive course from 9.30 to 12.30 and 1.30 to 3.30p.m, my daughter's day camp was from 9 am to 5 pm. A: It is our first time in China. I am 50 and my class-mates (young people from 18 to 30) coming from all over the world were available and very collaborative with me. I am in “Elementary 1” a sort of “survival kit” which are necessary for immediate needs: where am I, what time is it, how can I get a taxi and explain to the driver where I want to go, how to ask for the food in a restaurant, go shopping, understand the price and check the balance. Reaching such results in 2 weeks is really a very good achievement. Q: How do you feel about Shanghai ? A: Shanghai is a well-organized city. At the airport you have not to wait for your baggage, the immigration is quick out, together with my 11 old daughter I never felt insecure walking in the streets. A: - As you and your kids are tired after a long trip, arrange an airport pick up. - Credit cards are not always accepted, therefore it is better to have also some cash with you. A special thank to Fiona, Sherill, Amy, Vickie, Zheng Tao, and the teacher of my daughter Rebecca. Q: Is this your first time in China ? A: 中文的发音难，但语法还可以（西班牙语的语法比中文的语法难得多）。我很喜欢学习中文，我也非常喜欢 Mandarin House 的老师，他们很 nice 但是也很 strict. That pushed me to study. If you really want to study Chinese, homestay is very important. My homestay is very very good. We do a lot of things together in the evening and weekends. We play poke, majiang... I not only practice my Chinese but also know a lot of culture. That's great. I hope when I come back next year, I can stay with the same family. A: Stay with the Chinese family and come here for long time. Two weeks staying is not enough to know the real culture and life. A: No, I came to China in 1986. A: Incredible, not only for the knowledge or the Chinese language but for the understanding of the Chinese culture. A: Everybody at MH did a terrific job. The teachers are fantastic and the girls at the front desk very kind. Q: How do you feel about Beijing? A: The sense of community. How safe it is, and the quality of life. A: China is a giant in motion. I'm sure it is going in the right direction, to become the major economy in the world. China is very diverse, its gastronomy, ethnic group, regions. All these make it an interesting place to visit. A: It's my second year to study in Mandarin House. I love China. Everyone is friendly and nice! A: Things are so different from where I live in. The culture, the chopsticks…They are amazing! I like it! A: The Great Wall impressed me a lot! I have never seen such grand things before! A: Good. Lots of time to learn words and lots of time to practice around other teachers. Very fun. Teachers are all very friendly. Q: What do you find most interesting about Shanghai ? A: How everyone is so friendly and I can practice everyday. A: Being able to use the Mandarin I have learned during a massage treatment. A: Always be open to new things and try to always practice what you learn, and be friendly. A: I think the facilities are nice and the teachers are friendly and engaging. Shanghai is a good Chinese-learning environment, but it isn't what I would call a very traditional Chinese area, being that there are so many foreigners around and thus a lot of foreign cultures too. A: The mix of old and new, foreign and local cultures. A: One memorable experience is strolling around the small alleys and markets in Shanghai's Old Quarter near Yu Yuan Gardens. I really got a chance to speak Chinese with local folks and see a lot of local food culture in the markets. The people are very friendly and the sights and sounds are very unique. Another memorable time was visiting Tai Kang road and visiting the contemporary art galleries. I think this area represents an interesting side of contemporary Chinese culture in Shanghai. The shops and art on Tai Kang road show a wonderful side of modern China. A: I feel strongly that if one's goal is to understand some of the culture, one should spend as much time as possible in China and take things slowly. If on a short trip to Shanghai, say less than three months, it is enough to learn basic language and make contacts. However, to communicate well and live independently in China, I think it requires a long-term commitment of a few years. A: Yes, it is my first time. A: Very interesting and useful. A: Yes, I have improved my Chinese a lot! A: History, culture, Wang Fujing night market. A: Chinese way of life, Great Wall, try to understand Chinese. A: I strongly recommend a visit to China , try to make yourself understand Chinese. It is a great opportunity to improve your Chinese skills since you can practice it at any time. Chinese people are very friendly and always ready to help you. A: I have learned more than what I have expected. Teacher and our classmates made the course more fruitful. A: I have been very curious about Chinese culture, which was very different from the western. But still very fascinating. A: There are so many I could tell. But the most memorable experience was that I could share my emotions, feeling and experiences with my classmates. Also I have learned a lot from them and will miss them very much. A: Enjoy yourself when you arrive. Try to be as curious as you can and try to learn a new/very ancient culture. A: No, I came to China for 2 weeks back in 2007 and visited Beijing, Shanghai, and Guangzhou. A: Great. Mandarin is a very difficult language and the courses move very quickly, but the teachers are very patient and I am making a lot of progress every day and every week. Q: Has the program been as you expected ? A: The Mandarin house does a great job with all aspects of the experience. The classes and teachers are great, the extracurricular activities are a lot of fun, the staff is really friendly and helpful. It has exceeded all of my expectations. A: How can you fit so many people into one city? It is amazing to me that all of these people are able to coexist in one place. It makes for a very unique experience where you can find or do just about anything your heart desires. A: Going out at night is always a good time, they have some amazing bars & clubs here. I've also had a couple great day trips with my friends from Mandarin house to both Suzhou and Hangzhou. Both beautiful towns, but the trip was the real experience – taking the train, navigating the public bus systems, meeting locals and asking for directions. It's a lot of fun to use what you've learned to get around and see the sights. A: Get ready to work hard and have fun. Try to come with an open mind, especially in regards to food. Duck tongues aren't bad but I wasn't wild about bone marrow. A: Yes, I have had ɑ lot of chance to practice my speaking skill which is my main goal, especially during class. Because the teacher always encouraged me to speak. A: The combination of traditional and modern aspects. For example, you can choose either to go shopping in large department or visit historical places. A: Bargaining for goods in China. A: Keep your mind open to everything and try new things. For example, try new food and understand Chinese culture and lifestyle. 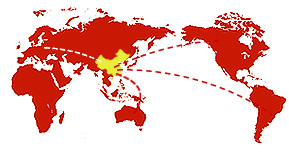 You will have a valuable experience in China! Q: Was this your first time in China? A: Yes, this is my first time to visit China . A: Yes, my expectation has been fulfilled as what I have written in the internet when I registered. A: If you visit Beijing, you will see not only modern buildings but also ancient ones and you will get surprise of what you have seen. China has developed fleetly! A: When I went to Forbidden City, I got amazed about what I have seen there. It seemed that I lived in ancient China, I enjoy myself. This experience would keep in my mind deeply! A: I was so happy to share my experience of learning in Mandarin House. My course was standard 20, in this group we concentrated on how to communicate with others. You can practice more of your oral Chinese. If you want to learn Chinese character you can register group of intensive 30. Chinese character is very important part of learning. A: Yes, I was pleased to be able to learn Chinese character as well as work on my speaking. I've visited. Also it's fascinating to spend time in such a rapidly developing city. Q: Tell us a few memorable experiences in China? A: Bargaining with market stallholder is very heated. Hopefully you will get a good price but it's over in seconds. A: Come with an open mind and no prior assumption and make the most of the time—go everywhere, not just the main sights. Ask the school staff for their recommendation. A: Yes, first time in mainland China . A: The studies are challenging, but the pace is good. A: Yes, the program fulfilled my expectations. A: I like the breathtaking views of Pudong and Puxi from the Shanghai World Financial Center . Shanghainese food tastes very good as well. It is a very international city. A: I will remember visiting the science/technology museum and the urban planning center. I will also remember the nightlife and bars by the Bund. A: Bring an adventurous spirit and make time for sightseeing. A: My studies in China was very, very good. Live the experience of language in daily situations at China combined with the classes in school, in my opinion is the best way to learn Chinese. A: The program was more than I expected. The teachers are very prepared and experienced, the books and materials are easy to understand, the classrooms and school facilities are spectacular, school employees are very pleasantness. All together helps the students to study smoothly. A: The hole city of Shanghai . In Shanghai there are lots of restaurants, bars, shopping centers, you can find a spectacular entertainment places. A very modern big city, safe and the people are very friendly. A: A memorable experience in China was a great dinner with Chinese friends at 87 th floor of Jin Mao Tower with a spectacular view of Pudong. Really beautiful ! Other memorable experience was live a routine in Shanghai, I mean, wake up, eat baozi at breakfast, take the metro and study, all of this, together, was sensational for me.  Do the course seriously, your time at school have to be concentrated in learning Chinese, so talk to people, study at home, pay attention at classes, ask everything you have doubts for teachers and if its possible, have some private classes. A: I was able to considerable expand my vocabulary. The lessons in china were very intensive. Unfortunately after my return I found it difficult to maintain practice due to a shortage of time. Hobbies: Art House movies, learning languages, sitting on boards of not-for-profit organizations. A: I saw the information from the internet. The French company suggested me Mandarin House. A: The sightseeing of China was attractive to me. A: When you have started learning Chinese, you need to review what you have learned every day. Being interested in learning Chinese is very important. You will improve yourself very quickly if you like it. It is essential to bring up interesting of studying Chinese! A: Fantastic—we have learned so much in such a short time. Unfortunately 2weeks has not been long enough. A: I found the information from the Internet. A: All of things were new and different for me, especially Chinese food. I really like to have Chinese food everyday. A: Chinese language is very different from our language. If you want to learn it very soon and good, coming China will be a good way for study. You c a n practice everyday .Before your coming to China , if you have learned a little Chinese before, that will be easy for you to adapt yourself to new environment of study. A: I liked to study in China, the whole school staff were very kind and friendly.Also I was very interesting to use the language in China itself. A: The details of daily life,and the fast growing city itself,at any time,at any place something is happening. A: I think one of the most important thing is: Learn and start to think in the Chinese way. Be open minded to get influenced by the Chinese way of thinking, you can't lose something but may win a lot. A: I found Mandarin House in a magazine. I contacted the person who was in charge of that magazine. A: I was very much interested in Chinese history and culture. In Beijing I could see many old historical buildings, at the same time Beijing is a very new and modern city. It is v ery interesting to know. A: Japanese people will see more interesting introduction about Beijing in magazine and come to Beijing for Sightseeing and buying things. Chinese language is so difficult to learn, so you need to work hard. Maybe it is good to make a simple book for a short term students when they start their Chinese course. I will introduce Mandarin House Chinese school to tr avel agency and make them to encourage Japanese tourists to visit this school. A: Excellent I appreciate the very small classes for the group lessions. Mandarin school teacher are excellent. I like the friendly atmosphere in the school. The apartment offered by the school is excellent. A: Until now Shanghai wild animal park. But we plan to go to Putuoshan next weekend. A: Chinese Language and Chinese Charakters are very different from languages spoken in Europe. Chinese is therefore not easy to learn. To become fluent in Chinese speaking I have to stay for at least half an year at Mandarin School. The combined course 30 is most suitable for fast improvement of speaking skill. A: I have really been enjoying my studies. I came to Shanghai with certain goals for my language development and I think that I have met those. Among them has been to gain a working familiarity with Chinese characters, and by studying them in parallel with the regular intensive Mandarin House course I feel that I have really progressed. Not only that, but I also find the city that much more accessible when you can recognize a certain number of basic characters. I found that there is so much to learn while studying Chinese that I never had a chance to be bored! It was a rewarding challenge to balance my studies with exploration of the city. A: Shanghai is such a fascinating city where ancient China meets modern world-class metropolis. The striking skyline is one of the most magnificent I can imagine, and I am at a loss to explain the magnetism that it emits. Walking through Shanghai, you inevitably walk through a city of contrasts: cultural, economic, linguistic, culinary. There is so much to see and explore, and I found myself often pondering not only China's place within the international order but also my own. I can certainly say that living in Shanghai for two months opened my views of not only China but also of where I want to take my graduate studies and career. Shanghai is truly a magnificent place for both external exploration and introspection. A: I would advise anyone considering study in China to come armed with an open mind, lots of patience, and the ability to find enjoyment in unexpected places. China is so different from the West but it has developed a system that works – you just have to persevere in discovering it daily in little ways. Studying Chinese can be frustrating at times because of all the different accents and manners of speaking – but each interaction adds to your knowledge and prepares you for the next. Sometimes you might come across hardships or the lack of the amenities at home, but when you see these moments as chances to appreciate cultural differences you will find yourself missing China's own unique amenities when you return home! A: Very interesting as Mandarin is very different from any European language. It has been a good challenge. A: The difference in culture and the opportunity to have many new experiences, sample different foods and meet people. A: Don't underestimate the difficulty of communicating! It is always worth planning ahead and trying to get addresses and instruction (for taxi /train) written by Chinese characters. Also, come open minded about Chinese customs and food: the experience will be very enjoyable. A: I had an absolutely fantastic experience studying in China. The combination of studying and being immersed in the culture can't be beat. A: I love the combination of old and new and the culture. And the food is amazing! A: Keep an open mind, talk with the people that live in the city, they are normally very happy that you are trying, take in as much of the culture as you can. Most of all get out and experience life in China! A: It was wonderful!!! I liked it very much, especially the people that I met at Mandarin House. At all times the teachers, employees and students were kind, friendly and willing to help me in my studies. My class was also amazing. Dominic from Australia , Serge from Congo, Marie-Christine from France and, of course, our teacher Zhang Ye gave me memorable moments and made my studies less difficult. I will miss everyone. A: Beijing is a big city! There are many people here and this moment is so important to them. I visited some beautiful and big places like Houhai, Beihai Park , as well as interesting places like Temple of Heaven , Qianmen and The Great Wall. A: I think that the best way to come and study here is to lodge with a host family. My host family was very nice. All time they worried about me and asked me what I would like to eat, where I would like to go, or if I needed any help with my studies. It was a big opportunity to practice what I had learnt in the classroom. If you plan to learn Chinese or any other language or thing don't give up! There are many ways to do the same thing. So, if you are unable to take one path, try another. Usually simple actions are enough to fix many problems, like say hello to everyone, for example. In Chinese it is very simple: Ni hao! But means more: "Hello, are you ok! Are you happy today?". Traveling, reading, going out, etc. A: I like studying in China , it's totally different from other countries I've been to before. A: Shanghai is a very large and busy city. There are lots of things you can do and see, so you're never bored. I like Shanghai because it manages to combine its traditional and modern elements. A: Be open and friendly, that way you learn a lot about China . There are lots of prejudices about China , don't believe in them and find out on your own which ones are true. Mandarin House accommodations are generally very nice, but if you're here for longer than 3 months, you should look for your own apartment. A: I found the course very helpful and have enjoyed learning a new language that is so different from anything I have done before. A: The hugely different culture and different food. Also during our stay we experienced a bit of the Olympic atmosphere. A: Don't expect anything to be easy, even a simple task like buying train tickets was a real challenge. Despite the fact that Beijing hosted the Olympics, very few people speak a lot of English. Be open to new experiences and try to learn as much as you can about Chinese culture and people. A: The classes are fun. Students come from all over the world, and the teachers are highly motivated and do a fantastic job handling different levels in classes. A: Friendly people, delicious food and amazing shopping malls. A: Very interesting, you can experience so much more of the city when you can speak the language. A: The way it changes every single day. A: Don't ask for the English menu, just point to whatever the guy at the next table is having. A: So many people, so many new things, everything changing so fast….it's happening! A: Learn Mandarin – it really helps you enjoy the city even more! A: Very interesting! I'm learning a lot in a short period of time. The course is well structured and very useful. - I like the architectural contrast of the buildings and their colors in the night. - I like the rising fashion awareness of Shanghai people. - I have much consideration for the ability of taxi drivers "moving" in this city. A: The summer is very hot, be prepared. Choose Mandarin House for their study. To buy a bike for little trips around the city. A: I think that being in China helps me learn mandarin much faster than if I would try to learn it in my own country. It's not an easy language to learn; therefore it helps a lot to be submerged in it. A: I find it very interesting that it's such an international city and yet it retains its traditional Chinese culture. I love to see the two mix. A: My studies in Shanghai have been the perfect introduction of the Mandarin language and a great opportunity to get at least a first insight in the Chinese way of living. Besides I have enjoyed the acquaintanceship and inspiring exchange of ideas with my classmates coming from allover the world very much. Probably I am not the only student who regards an accurate pronunciation and an improved listening comprehension as a true challenge... The more I highly recommend spending some time in China to further expand your “listening experiences / habits” – and your sense of humor in case of inevitable linguistically lapses. A: Schedule enough time for the repetition of the learnt lessons in order to ensure that your new Mandarin knowledge is saved in your long-term memory. Be carefully in learning the correct tone (also in Pinyin writing!) because the more your vocabulary is growing the more you will notice that you are depend on the phonetics to decrypt the spoken and written Mandarin / Pinyin. Don't be afraid of making mistakes if you are talking to local people. A smile is understood everywhere. Hobbies: Bīng qiú (Ice hockey), huáxuě (ski), travel, attempting to learn Chinese. A: They were intensive, I would not have gotten as far had I not come to china, my studies are very applicable. A: Development of city, mixture of architectural old next to new, it is a forward moving city very good energy. A: Don't over pack, there is plenty to buy here; Make sure you have check card, cash is used most often; Take chance and try the food from the street vendors; One funny bit of advice to my fellow black (African) Americans, the words for "this" and "that" are "zhege" and "nage" which may sound offensive but are totally innocent..